Police say a livery driver beat a 62-year-old man as he walked to synagogue on Sunday morning in Brooklyn. BOROUGH PARK, Brooklyn (WABC) -- Police say a livery driver beat a 62-year-old man as he walked to synagogue on Sunday morning in Brooklyn. 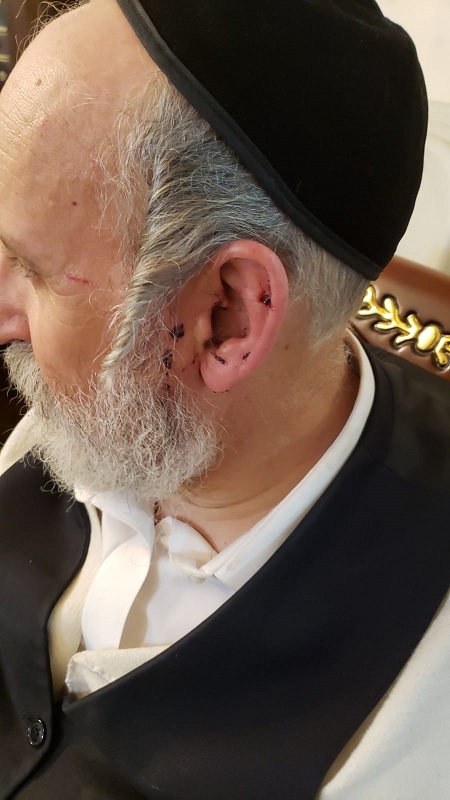 Physically and emotionally scarred, Lipa Schwartz described the frightening moment he was attacked in broad daylight in the middle of the street in Borough Park. "All of a sudden, 'boom,'" he said. "I tried to protect myself, run away. I fell. He come again on me." Schwartz was on his way to service, which he attends every day, when he said the driver jumped out of his cab and started attacking him. The savage beating happened on 13th Avenue by 46th Street. The victim's holy items were scattered on the ground. Another member of the Hasidic community tried to help, and the attacker then chased after him. An arrest was made quickly on the scene. Eyewitness News is told 37-year-old Farrukh Afzal, from Staten Island, drove for a car service in Brooklyn and has been arrested numerous times. "I went to him when he was handcuffed, 'what did I do to you that you tried to murder me? Tell me,'" Schwartz said. "He didn't answer back." Schwartz says he has no idea why the man attacked him, but he said he thinks it was because he is Jewish. Initially, detectives said hate crime charges could be filed, but further investigation led them to believe the attack stemmed from a road rage incident. Investigators said Afzal was upset because the victim was blocking his car, and that there is no indication that victim's identity was a factor. Afzal was arraigned on charges of attempted assault in the second degree, assault in the third degree, menacing and harassment. There is no hate crime component in these charges. The car service where he worked has informed Eyewitness News that Afzal has been fired. The TLC released a statement saying, "The driver is not licensed by the TLC, and has been summoned by the TLC in the past for unlicensed operation of an unlicensed vehicle and being an unlicensed operator."